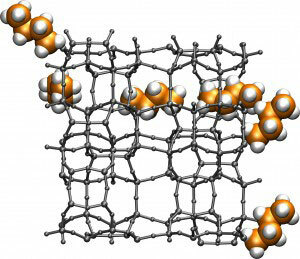 (Nanowerk News) With the passage of a molecule through the labyrinth of a chemical system being so critical to catalysis and other important chemical processes, computer simulations are frequently used to model potential molecule/labyrinth interactions. In the past, such simulations have been expensive and time-consuming to carry out, but now researchers with the Lawrence Berkeley National Laboratory (Berkeley Lab) have developed a new algorithm that should make future simulations easier and faster to compute, and yield much more accurate results. Haranczyk is co-author of a paper that appears in the Proceedings of the National Academy of Sciences entitled: “Navigating molecular worms inside chemical labyrinths.” The other author of this paper is James Sethian, who heads the Mathematics Group of Berkeley Lab’s Computational Research Division, and is also a professor in the Mathematics Department of the University of California, Berkeley. A key to the success of this new algorithm was its departure from the traditional treatment of molecules as hard spheres with fixed radii. Instead, Haranczyk and Sethian constructed “molecular worms” from blocks connected by flexible links. These molecular worms provide a more realistic depiction of a molecule’s geometry, thereby providing a more accurate picture of how that molecule will navigate through a given chemical labyrinth, as Sethian explains. As a molecule navigates through a chemical system, its access to a particular site or place within that system determines the extent to which catalysis and other chemical reactions may occur. Many of these critical sites are either buried in clefts, pockets or hidden cavities, or else represent channel systems. The accessible volume of a chemical system – the free volume available to a penetrating molecule – is also critical to the system’s physical properties, including diffusion, viscosity and electrical conductivity. Predicting whether a molecule will be able to traverse through a given chemical labyrinth is the first question that a simulation must answer, followed by identifying the shortest transverse route, finding the largest probe that can transverse though the system, and calculating accessible volume. Haranczyk, looking to automate the process by which the void spaces of porous materials are analyzed, had an idea for a probe that would walk through the inside a material and map it. Sethian had been working on mathematic techniques that can be used in robotic navigations and path planning, as well as a host of algorithms for computing geometries in complex settings. “What’s exciting here is to bring together two disparate worlds to build a new technology” says Sethian. The two scientists pooled their expertise to develop the molecular worm algorithm, which they first tested on a zeolite material. Zeolites are microporous minerals that have been widely used since the late 1950s as chemical catalysts, membranes for separations, and water softeners. They are especially useful as alkane-cracking catalysts in oil refinement. The successful testing of the molecular worm algorithm on a typical alkane-cracking zeolite opens an immediate door to its use in screening for new zeolites as well as a wide variety of other porous materials. The algorithm should also prove valuable in the search for materials that can capture carbon emissions before they enter the atmosphere. With further refinements, it could also one day be applied to proteins, especially enzymes. “Being at the frontier of science and solving a very complex problem that has not been addressed before is always very exciting,” Haranczyk says.